Several features of this instrument suggest that it was not produced in a commercial workshop. The dividing and engraving, for example, are not of high quality and there are some mistakes, while the rete is rather crude. The absence of a swivel in the shackle is odd, as are two lugs to keep the latitude plate in place. Marking the latitude projections for particular places, in this case Paris and Lille, is also unusual, and suggests the influence of a particular individual who has designed the instrument for his own needs. The religious content of the decoration and inscription indicate that the owner was a Jesuit, while the prominent inscription on the rule asserts that 'ICK TOEBEHOORE PHILIS DE DIN' ('I belong to Philis de Din'). 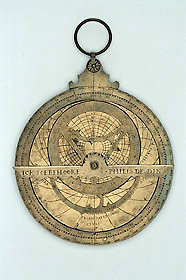 It seems probable that a Jesuit with an interest in astronomy has decided to make his own astrolabe, a practice recommended in a number of textbooks of the period.